Though it shames me to admit it given recent events, Godzilla has been on my mind. I know — lame, crass and superficial, like being at war with Norway and fearing a valkyrie invasion. Nonetheless, the big gray guy has been popping into my thoughts a lot more often than he has at any other point in my life. And it got me thinking: Where’d he get his name, anyway? Anyone who doesn’t know that the Anglicization Godzilla comes from the Japanese Gojira deserves to lose all film geek status, but I feel like few people know that Gojira comes from a combo of the Japanese gorira — meaning “gorilla” and itself a Japanization of that word — and kujira, “whale.” At one point, the creature was conceived of as a hybrid gorilla-whale, which makes me suspect that Godzilla could owe even more of a debt to King Kong than I initially believed. There’s also an apocryphal story about Gojira being a nickname for a hulking employee at Toho Studio, which has produced the Gozilla movies, but no one has yet proved it. 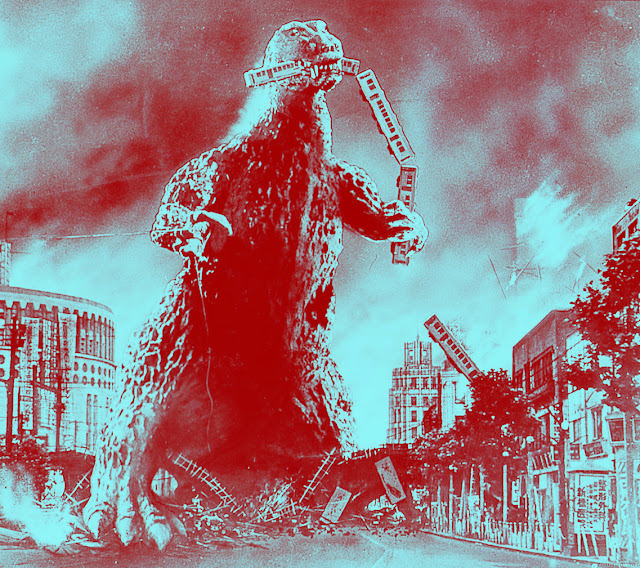 A bit more: Remember that dead-eyed, awful American Godzilla? With Matthew Broderick? And Jamiroquai? The one that managed to be more of a Jurassic Park rip-off than an actual Godzilla movie? According to Wikipedia, The city-destroying lizard thing from that movie goes by two names: GINO (an acronym for “Godzilla in name only,” coined series fan Richard Pusateri) and Zilla, the name given to the American creature by Toho staff, who allegedly found it inferior and decided that it did not deserve to have God in its name. Which is awesome. Alongside the real Godzilla and more respected monsters such as Mothra and Ghidorah, Zilla is actually featured in Godzilla: Final Wars, the 2004 film that serves as a fiftieth anniversary mark for the franchise. In it, real Godzilla fells Zilla almost instantly. Take that, Matthew Broderick (and to a lesser extent, Maria Pitillo). I know, I know. I should just rename this blog “Drew Reads Wikipedia.” If you can think of a better place to read endless information about stuff only a small faction of geeks truly cares about, then I’d love to hear where. I thought of you, and this blog today. I passed a sign a couple days ago advertising a new soft drink called "Mello Yellow." Today I remember I'd have not known what that song had been talking about had it not been for this blog. Keep the wikiwalks alive. Apparently I need the pop cultural references, even if no one around me understands why I'd find an innocuous bus sign hilarious. Ah yes, Mellow Yellow. For the record, however, Mello Yello isn't new. I think it's just been relaunched. There's a Simpsons reference for this: Lisa, describing the concept of arch enemies notes that Mello is Mountain Dew's rival, and "even Maggie has that baby with the one eyebrow."